Sometimes teeth are lost and no permanent teeth are there to replace the gap. When you have children, you suddenly learn a lot about dentistry. You’ll find out that children are challenged with all sorts of dental problems, many of which are similar to adult dental issues. One such issue is tooth loss. Sure, children lose teeth all of the time! If they didn’t, the Tooth Fairy would be out of business, and children all over Charlotte would be devastated! However, sometimes children are missing the wrong teeth. Surprisingly frequently, pediatric dentists see children who are born without certain permanent teeth even though the baby teeth have fallen out. These are children who will grow up to be adults with missing teeth. The most commonly reported missing permanent teeth are the upper lateral incisors and the lower first molars. While parents would certainly want to replace those missing teeth with the best available form of dentistry, it’s important to time everything just right. For example, we know that dental implants are the best choice for replacing missing teeth, but are they the right choice for children? Strong, dense bone support is incredibly essential to the initial healing and the longevity of a dental implant. Unfortunately, a child’s jaw bone isn’t typically mature enough to handle such a huge responsibility, and there’s a good reason for that. Young bones are still growing and developing, a process that takes 16-18 years. A child of 11-12 years old is still undergoing the growth process. The bone is still soft enough to be shaped and manipulated relatively easily, a good characteristic for braces but an unfavorable characteristic for dental implants. It is generally recommended that dental implants be postponed until the later teen years or the early twenties if possible. If the missing tooth creates a chewing problem, a speech problem, or a self-confidence issue, the dentist might suggest a removable tooth replacement such as a ‘flipper’ or a retainer. There are various temporary tooth replacement solutions to ensure that your child feels comfortable until the time is right for dental implants. 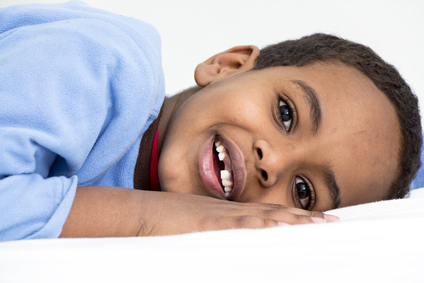 Find out more about tooth replacement for children by contacting a pediatric dentist for an evaluation today.